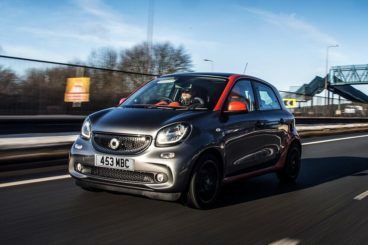 If you drove the old Smart ForFour, you’ll no doubt remember it well, and the fact that there is a Smart ForFour on the market will no doubt bring a smile to your face. It’s been eight years since this car went out of production, but this new one – which is a derivative of the new Renault Twingo – is prepared to take the baby bull by the horns straight away, rocking up next to its rival, the Hyundai i10, with a new shape, affordable running costs and a wealth of customisable features. Let’s take a closer look at what the Smart ForFour offers. One of the previous Smart ForFour problems was behind the wheel performance. This area has been much improved rather than simply patched up. Thanks to an enhanced rear-wheel drive chassis and an 8.65cm turning circle, the 2015 Smart ForFour is incredibly flexible and can navigate urban sprawls really quite well. And whilst last time around, you really felt a bump ’n’ grind when driving over some of our poorer roads – and even some of our not-so-poor roads – the Smart ForFour is much more cushioned and manages any surface pretty well – probably in large thanks to sharing a chassis with the clever Renault Twingo. All the engines are new. There is a base-level three cylinder 1.0-litre 70bhp engine on offer, but most drivers will opt for the 90bhp variant of this engine, for which you’d have to pay a £600 premium. It comes wedded to a five-speed manual gearbox, and thanks to the implementation of some sound deadening, this is a pretty quiet car when you reach the higher speeds. One thing to note though; this is a car built for the city, and once you leave the city, you’re confidence in its capabilities may drop. Just look at those skinny tyres! Take those out for long trips on the lonesome open road and you might as well pray to God. New Shape – New Everything! 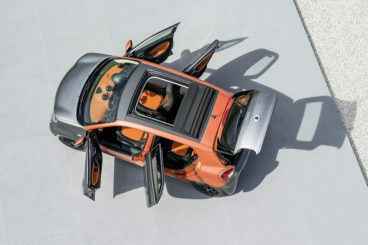 The new Smart ForFour comes with a new shape and thus new dimensions. Last time around, it originated its shell from the Mitsubishi Colt, but this time around it takes its clues from the aforementioned Twingo. Ultimately, whilst it’s managed to retain its idiosyncratic looks of last time around, it looks much cooler and slightly more orthodox these days (which is a good thing), but it still falls behind rivals when it comes to space. The new Hyundai i10, for example, is much more spacious. Still, the 180-litre boot is only one thing to consider, because the 2015 Smart ForFour does come with a few smart features that enhance space. And if you fold the rear seats, you get 975-litres of boot space. And we can’t say fairer than that. And whilst the shape is entirely new, so too, in fact, is the whole model. As mentioned, the engines are new, and so is the chassis. 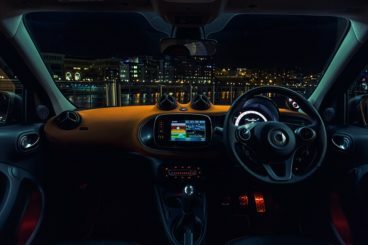 This might be alarming news when you consider how reliable its predecessor was, but this time around you do get better performance – as well as a whole host of new features that allow you to customise your Smart ForFour. Two neat features are the Crosswind Assist and a forward collision warning. The 2015 Smart ForFour price range starts out at £11,620 and rises to about £14,315. Some will argue that this still makes the Smart ForFour a little too expensive – and they could well be right, but you’ll be able to get hold of a used Smart ForFour for a little less. Standard equipment across the range includes 15” steel wheels, black grained door mirror caps and a 3-spoke steering wheel. The Smart ForFour is cheaper to run nowadays, with the 1.0-litre 90bhp returning 67.3mpg whilst emitting just 97g/km of CO2. Both engines are free to tax. Early critics have accused the 2015 Smart ForFour of still being too expensive, but you can compensate this by virtue of the fact that this car is only £495 more expensive than the less practical and less useful Smart ForTwo. Moreover, running costs here are excellent, whilst both engines are free to tax. Aside from the price, the Smart ForFour is easily a great improvement on its predecessor which disappeared 8 years ago. It’s better looking, performs better, and is one of the most mobile city cars around. If you are looking to get hold of a trendy little city car that can turn on a sixpence, this might just be the one for you. All hail the return of the Smart car. 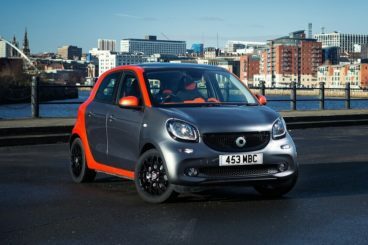 If you want to get hold of the new Smart ForFour don’t hesitate to leave us a message on our contact page, or give us a call on 01903 538835 to find out more about our Smart lease deals.